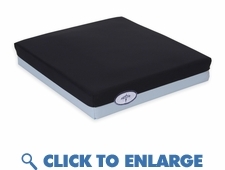 This wheelchair gel cushion is designed to assist in the prevention and treatment of pressure ulcers. The inner viscous gel bladder distributes the patients body weight and redirects pressure from contact points. The cover has a waterproof low shear nylon top and a nonslip bottom for patient safety. This skin protection wheelchair cushion is designed to reduce friction allowing easy patient transfer. The wheelchair cushion cover is removable and washable. Designed for both comfort and function, Nylex-Covered Gel/Foam Wheelchair Wheelchair Cushions utilize a gel pack placed between two layers of resilient foam to stabilize wheelchair patients while reducing pressure.